This is the first edited volume dedicated specifically to exploring humor in the academic world. It is a rich collection of essays by an international array of scholars representing various theoretical perspectives and practical orientations in the disciplines of Linguistics, Literature, Cultural Studies, and Translation, but all concerned with the interactional aspects of humor. This is the first edited volume dedicated specifically to exploring humor in the academic world. It is a rich collection of essays by an international array of scholars representing various theoretical perspectives and practical orientations in the disciplines of Linguistics, Literature, Cultural Studies, and Translation, but all concerned with the interactional aspects of humor. The two main reasons behind the publication of this volume are, first, to continue the journey along the path towards full recognition of humor as a discipline worthy of research and assessment, and, second, to offer a new and integrating perspective on hu¬mor to showcase the wide range of dimensions that it offers. 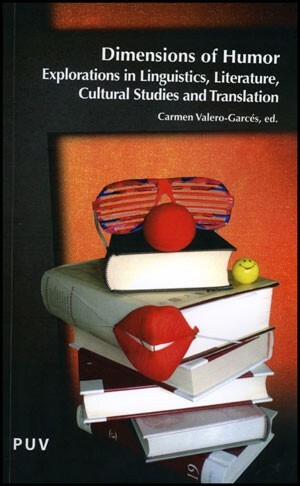 This book is sure to become an important reference and source of inspiration for scholars in the various subfields of Humor Studies: Linguistics, Literature, Cultural Studies, and Translation. Aquest és el primer volum editat dedicat específicament a l'exploració de l'humor al món acadèmic. És una rica col·lecció d'assajos escrits per una selecció internacional d'acadèmics que representen diverses perspectives teòriques i orientacions pràctiques en les disciplines de Lingüística, Literatura, Estudis Culturals i Traducció, però tots preocupats pels aspectes interactius de l'humor. Les dues raons principals que motiven la publicació d'aquest volum són, en primer lloc, continuar el camí cap al ple reconeixement de l'humor com a disciplina digna de recerca i avaluació, i, en segon lloc, oferir una nova i integradora perspectiva sobre l'humor i mostrar l'àmplia gamma de dimensions que ofereix. Aquest llibre segurament es convertirà en una important referència i font d'inspiració per als acadèmics en els diversos subcamps dels Estudis de l'Humor: Lingüística, Literatura, Estudis Culturals i Traducció.